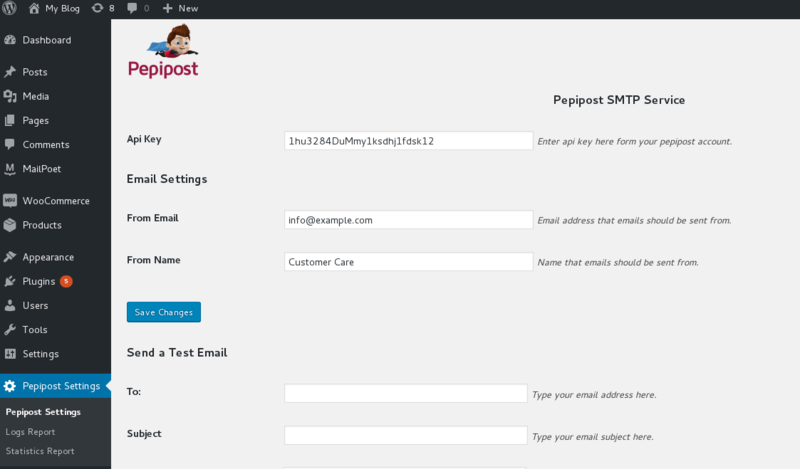 Wordpress SMTP Integration | How to Integrate Pepipost With Wordpress? WordPress uses mail() function in PHP to send emails. Many shared hosting service providers either have this function misconfigured, or they disable it entirely to avoid abuse. In either case, this causes emails from WordPress to not be delivered to your users. The alternative solution would be to use an email service provider like Pepipost to send emails via SMTP server. To send email through Pepipost using WordPress we recommend the Official Pepipost WordPress Plug–in. Our easy-to-use plug-in uses API integration to send outgoing emails from your WordPress installation. It replaces the wp_mail function included with WordPress. To install, use the WordPress admin panel or follow these instructions. Once installed, click on the “Settings” link for the plugin on your plugins page or click on Pepipost Settings on the side menu as shown below. The above image shows these settings. API key: Get the API key from your Pepipost account and enter here. From Email: The from/sender email address e.g. info@example.com. Note: In this case, the example.com domain needs to be pre-verified and approved on Pepipost. Login to your Pepipost account to add and verify your sender domain. Unless the domain is approved, you will be not be able to send any emails. Once all the settings are done, click on “Save Changes”. Once the settings are done, you can send a test email once the settings are done, you can test the email sending also, as shown below.